Paisley, and Polka Dots, and Paw prints...OH MY! Living in the world of PRINTED VINYL! The world of vinyl would not be complete without printed vinyl. It can change your vinyl project in minutes from simple to spectacular. The great thing is that it can be customized to your particular themed project by being printed in store at Niche Creative Studio upon request. Now printed vinyl is a little trickier than using regular Siser Easyweed or Stahl’s matte vinyl. Here are the steps and a few tricks to mastering printed vinyl. We have several different kinds: HTV Printed Vinyl, HTV Glitter Printed Vinyl, and Adhesive Printed Vinyl. When creating your design in your software the big difference is to NOT mirror your image. Print vinyl shows really well when using block fonts or thicker lines or shapes. 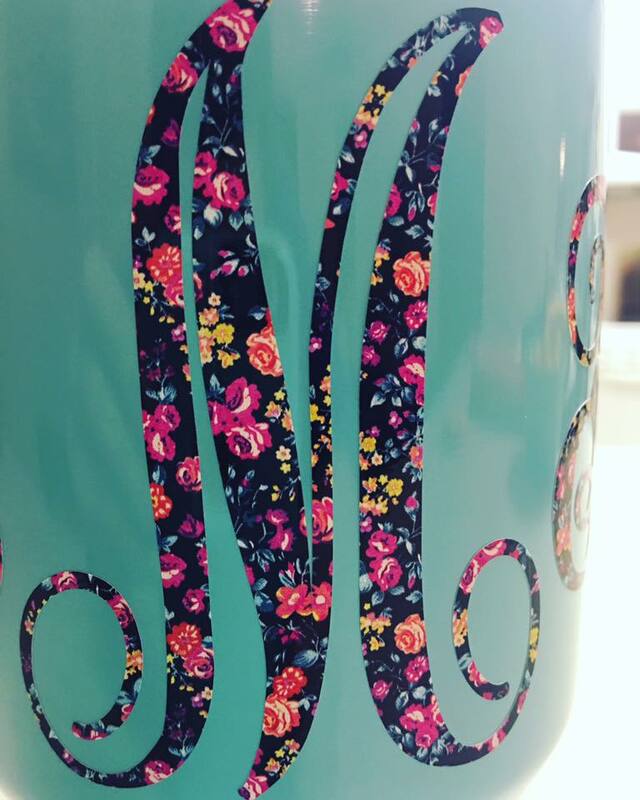 You can use it for swirly monograms and thinner lines but if you do you may want to offset it with a coordinating color so the print can stand out and be the star! When you go to cut your vinyl you should place the vinyl with the print side up on the mat. Weed your design leaving the end product on the mat. Now take your HTV transfer sheet and place it on top of the design. Transfer the design to your blank (i.e. shirt, bag, koozie, etc.). Heat your garment at 305 degrees with medium to firm pressure for 10-15 seconds. Remove transfer sheet and press garment one more time for 8-10 seconds. When you want to go the extra mile and add a bit of shine try our BRAND NEW Glitter Printed Vinyl. You would use the same method with printed vinyl by cutting face up and DO NOT MIRROR IMAGE. To transfer to garment use a High Tack Transfer Sheet, which is available in store of course! Preheat your heat press at 305 degrees and apply medium pressure for 12 seconds. You can peel the transfer sheet while it is still hot and press once more for 8-10 seconds. We also carry a large selection of printed adhesive vinyl. Same concept of designing and cutting. Do not mirror and use an adhesive transfer sheet to transfer the design to the cup or item. No heat necessary. If you don’t need a large sheet of Printed vinyl and are working on a small project try one our mini printed sheets to practice with. 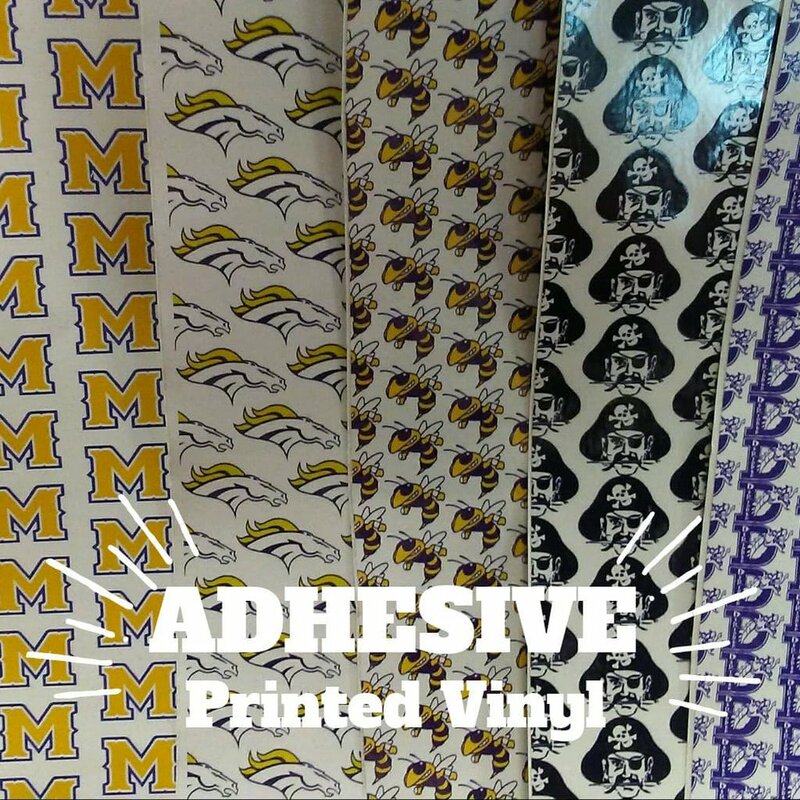 Visit our store to check out our printed vinyl and if you don’t see what you need ask one of our associates for a custom option.